A Globe pressman checked a sample paper. 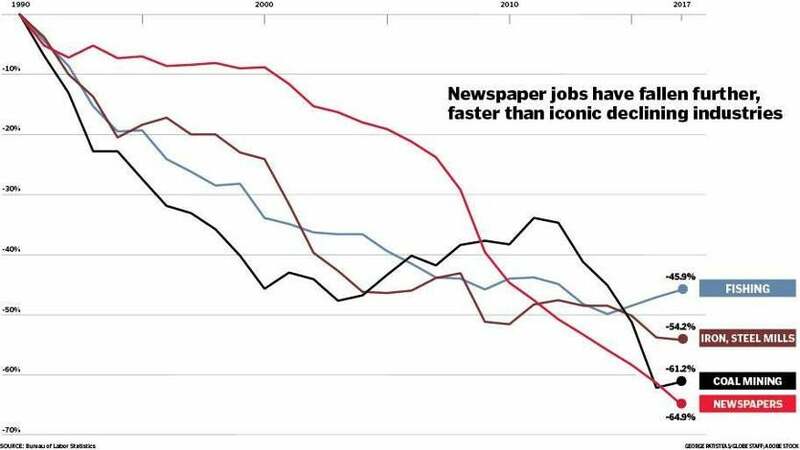 The newspaper industry has declined faster and fallen further than some of the most famously collapsing sectors of the American economy. 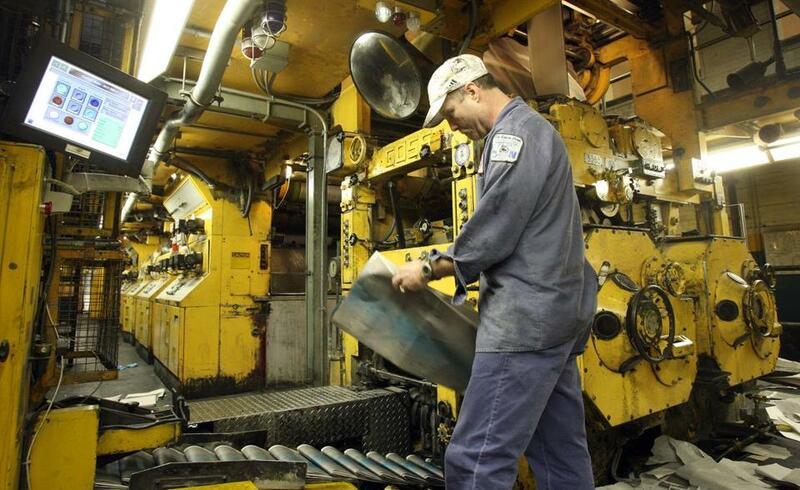 Coal mining, steel manufacturing, fishing: They can’t match the job losses and wage erosion in the newspaper business over the past few decades. At the dawn of the 21st century, when the Internet was young and print advertising was still a viable source of revenue, newspapers employed more than 400,000 people across the country, in every state. The business was bigger than the motion picture industry, with as many total workers as you find in such coast-to-coast fixtures as bars and hair salons. Since 2000, however, newspaper employment has fallen by more than 60 percent. That’s as big a fall in 18 years as the coal mining industry has suffered over the last 27 years. And while the job losses in steel and other much-eulogized American manufacturing sectors have started to level off, or even turn around, in recent years the newspaper industry has continued to shed roughly 1,000 jobs per month. The real-world consequences of this collapse are increasingly clear: Nearly 300 English-language daily newspapers have disappeared from the US landscape in the past 20 years, cutting two-paper towns down to one while some smaller markets lose local coverage altogether. Among other things, recent research suggests this has reduced the oversight of local officials and increased government waste. While you might have hoped that the decline of printed newspapers was being offset by a rise in Internet-based news coverage, that doesn’t seem to be the case. Direct comparison is tricky, because there are no equivalent industry data for “online news,” but a separate count of “reporters and correspondents” across print, broadcasting, and the Web has shown a steep decline in recent years. Plus, even if writers were simply migrating from failing print outlets to thriving online outfits — which they are not — that would still leave a question about what’s happening to all of the other people who make the newspaper industry work: the folks who do everything from editing and photography to printing press maintenance and daily delivery. No state or major city has bucked this trend. Newspaper closures aren’t just happening in rural counties or struggling cities; they’re happening everywhere. Such regionally distinct places as Florida, California, New Jersey, and Michigan have each lost roughly 70 percent of their newspaper jobs. In some cities, the declines are even more concentrated. America’s premier metropolises have also seen declines. In San Diego, newspaper employment is down 83 percent since 2002. In Miami, it’s 75 percent; Denver 73 percent; and Dallas and Atlanta, 67 percent. Even New York and Washington, D.C., home to the papers that have arguably built the most successful national brands, have shed at least 50 percent of their newspaper jobs over the last 15 years. This is one of the aspects that distinguishes this declining industry from many others. Steel manufacturing is centered in the Great Lakes region, and coal mining takes place mostly in rural areas, but newspapers are — or used to be —everywhere. Big or small, rural or urban, coastal or central, every community needs information about vital local issues. That’s hard to do without local workers, because news can’t be traded the way steel is. You can’t put all the reporters in New York and expect to effectively cover issues in Nebraska. Nor can you outsource news production to Canada or China, the way you might outsource apparel manufacturing. For Americans to get relevant local news, the economy needs to maintain some kind of news-focused industry that’s coast-to-coast. But how? With online-only sources struggling to fill so many gaps, one alternative is for philanthropic gifts and grants to make up for lost profits, essentially converting news from a business to something more like a nonprofit sector for the public good. But this, too, has been slow to materialize. Recent research from Harvard’s Shorenstein Center on Media, Politics and Public Policy found that foundation funding for nonprofit news operations has been both insufficient to meet the overall need and overly narrow by focusing too much attention on the Northeast. Without some tractable approach, though, it’s not clear how far the job losses may extend, or how completely the news industry may eclipse steel, coal, and others as the great, declining industry of modern America. Evan Horowitz digs through data to find information that illuminates the policy issues facing Massachusetts and the nation. He can be reached at evan.horowitz@globe.com. Follow him on Twitter @GlobeHorowitz.